Placed purposefully in the middle of Indiana, is the city of Indianapolis. Known to some as India-no-place, Naptown, the Circle City. It's known for a really big race track, and a big monument in the middle of town that we string lights on, then call it "The Worlds' Biggest Christmas Tree". Indianapolis is also the home of the drug company that invented prozac, the drug that is liberally dumped into the citys' water supply whenever the local NFL franchise loses early in the playoffs. I've lived here all my life. I've traveled the world, from Cairo, Egypt, to Malibu, California, but I keep coming back to Indianapolis. Why? Because, just like my parents, and my grandparents before them, I just don't know any better. Well, that's not entirely true, there are a lot of good points about living here. Plus I know all the short cuts around town, and hardly ever get lost. If I moved now, I'd be asking for directions for the next five years. Supposedly, I'll have a few of this blogs images published in a local weekly tabloid run by the Indianapolis Star, the big daily paper around these parts. I'd like to say welcome to any new local people who happen by. I hope to double my Indianapolis blog visitors, thanks to this great p.r. That's right, I hope to get up to six hits from Indianapolis today. If you see me around town, feel free to buy me an imported beer as a hearty congratulations for my book deal! I'll gladly autograph a cocktail napkin for you! 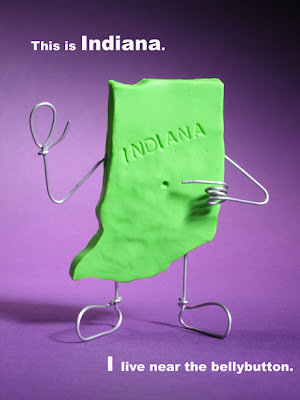 Any Indianapolis readers that are still reading this with a sense of humor, please leave me a comment. Tell the world something about Indianapolis that only a citizen of our fair city would know.